Japan is a nation described by stasis, lethargy, and fatalism … along with a pleasant lifestyle. As Japan prepares to host the G-7 Summit this year, stasis, lethargy, and fatalism, along with a pleasant lifestyle, best describe the archipelago in 2016. The cabinet wants to stabilize the population from the current 125 million to 100 million. This entails accepting a loss of over 20 percent, a fate normally visited only on lands plagued by terrible wars or pandemics. Robotics may replace humans. Science could make 90 the new 60, keeping seniors on the job into their 80s. But unless these deus ex machina drop down on the stage now, the future is grim. With the probably impossible aim of a 1.8 births/woman fertility rate, 100 million is but a waypoint on the road to oblivion. Requests by the finance ministry to cut down the number of schoolteachers as children disappear show where Japan is heading. Prime Minister Abe wants to empower women to better utilize half of the labor force but in fact his government has done very little to make this a reality. The cabinet is not seriously thinking about Japan’s need for massive immigration. On the economic front, though Japanese manufacturers still supply many critical components, Japanese industry and society as a whole have been partially bypassed by the ICT revolution. Abenomics has not delivered any meaningful results. Japanese often argue theirs is a conservative society allergic to innovation. Their own history disproves this orientalist cliché. From 1855 to 1890, Japan evolved at a faster pace than Britain, France, or the United States ever did. Soviet Russia, Maoist China, and Nazi Germany, metamorphosed more rapidly, but unlike Japan theirs was a fast track to hell with no return ticket for tens of millions. Nor is Japan wedded to gerontocracy (or at best middle-age-cracy). Many of its leaders in the 1860s and 1870s were younger than John F. Kennedy and Barack Obama were on the day took the oath of office. As they invented a new Japan, these statesmen tossed ancient traditions into the dustbin of history, built a state nearly ex nihilo, and created a new imperial system and official religion. Why is Japan today the polar opposite of what it was in the 19th century? There are random factors which account for the proliferation, or lack, of genius. But elite selection is one key. Modern Japan’s Founding Fathers were conspiratorial nobles, seditious junior samurai, and autodidacts. Born away from the centers of power, they quickly reached the top thanks to their drive to grab opportunities by fair and foul means. They embodied Machiavelli’s virtù with the strength to bend fortuna to their will. 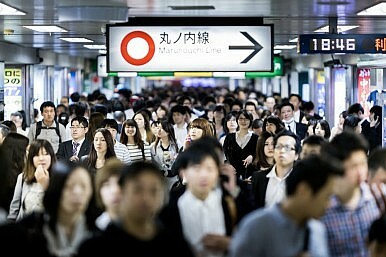 In 21st century Japan, the path to the top is narrow and slow. Almost all senior positions in government, business, the media, and academia, are held by men (and rarely women) with degrees generally from a few undergraduate faculties in central Tokyo. Upon graduation, even the best and brightest toil in obscurity for decades before attaining high rank unless they set-up their own firm (which is harder in Japan). Upon retirement, elderly men retain influence as members of committees, heads of associations, and honorary chairmen. From the time they start school, future Japanese decision-makers go through filters that weed out the eccentric and the impatient personalities. Once on the job, junior professionals lack autonomy. Decision-making procedures hinder managers from displaying personal initiative. In the public sector and many corporations the hours are insanely long, and vacations short, insuring a “mind-numbing” office atmosphere. There are imaginative and iconoclastic personalities in the Japanese establishment, but their impact is limited by their small numbers and the preference given to microscopic gradualism over innovation. “Hereditary” politicians who succeed their parents – thanks to sheepish voters – can skip the requirement to keep a low profile until they reach late middle age. Of the eight 21st-century premiers, four were sons or grandsons of prime ministers, another the son and grandson of a cabinet minister, and one was from a local political family. If princelings are lucky to get into parliament in their 20s or early 30s thanks to the untimely death or retirement of their parent, they can join the cabinet at a young age. However, their quality is limited by the laws of probability: In a nation of 125 million souls most of the talent will not be concentrated in families of professional politicians. Moreover, as heirs to a dynasty, why would they overthrow a system that served them well and will benefit their offspring? Casius’ words to Brutus apply to Japan: “Men at some time are masters of their fates /The fault, dear Brutus, is not in our stars /But in ourselves, that we are underlings.” Unless Japan as a nation abandons its fatalism and takes charge of its future, it’s impossible to be optimistic. Sadly, at this point, Japan is unlikely to surprise us. The top ten percent of Japanese society are still doing well. The alliance with America can handle external challenges. The parochialism of the ruling caste blinds it from seeing how the rest of the world is adapting. Therefore, unless a great leader(s) shows up, Japan will require a massive shock to awake from its slumber. Robert Dujarric is Director, Institute of Contemporary Asian Studies, Temple University Japan ([email protected]).